PINK FLOYD The Amazing Pudding/Syds Opel Faultline (Issues 2-16 of The Amazing Pudding [excluding issue 15], and 7 non-sequential issues of Syds Opel. Both fanzines were founded by Ivor Trueman who elso edited them before going on to co-found Delerium Records. Containing articles, cuttings, and various thoughts and opinions on Pink Floyd, Roger Waters, Syd Barret, and various other projects of all the bands members. 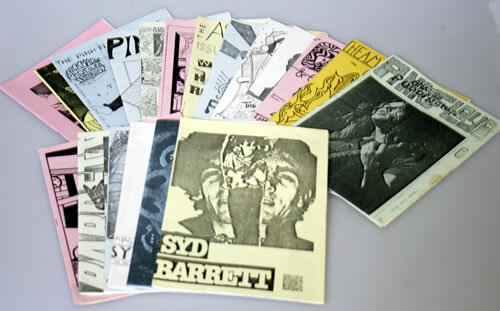 All 21 fanzines are in excellent condition given their age, beleivedto be from 1983 till around the late 80's. An essential Item for Pink Floyd collectors and will make for some interesting reading! ).